Six months ahead of the vehicle’s UK launch, Renault is celebrating the first of what it believes will be many deals for its electric Kangoo Van Z.E. (Zero Emission). Its first order, for six vans, has been placed by longstanding customer JCDecaux, Europe’s largest ‘out-of-home’ advertising company. Set to arrive in showrooms this October, priced from £16,990 excluding VAT, the Kangoo Van Z.E. is already attracting significant interest from public and private organisations alike, seeking to promote the ‘greener’ side of their operations. In the UK, JCDecaux’s presence covers all major cities, including London, Manchester, Birmingham and Glasgow, making the Kangoo Van Z.E. the perfect choice for its fleet requirements as the infrastructure for charging the vehicles already exists. The Kangoo Van Z.E. features the same dimensions, equipment and look of the internal combustion-engined versions, together with identical load capacity (ranging from 3 to 4.6m³ depending on model), payload (650kg), load length and high levels of comfort. 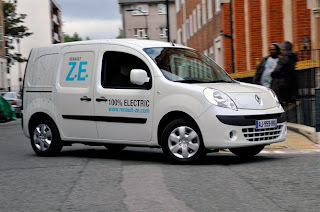 Darren Payne, director of fleet and commercial vehicle operations at Renault UK, said: “The fact that a company of JCDecaux’s size and reputation is investing in six Kangoo Van Z.E.s, is a fantastic third-party endorsement of our commitment to zero-emission vehicles. Mark Cooper, group operations director from JCDecaux, said: “Here at JCDecaux, we have always been industry innovators and have done everything possible to reduce our carbon footprint, and believe that in the major cities where we operate, the transfer of our fleet from fossil fuels to electric is a major step forward in aiding this process even further.